I'm a forgetful person and one thing that I usually forget to do is paying my Smart Bro bills. This activity is at the fringe of my mind but the Smart Center is out of my way so I forget about it. 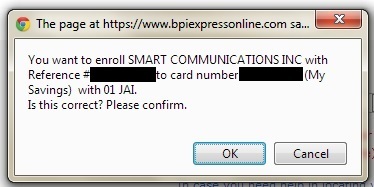 I don't want to forget about paying my Smart Bro bills so I decided to enroll my Smart Bro bill to my BPIExpressOnline account. Enrolling bills in BPIExpressOnline is required before I can pay my Smart Bro bills so I have no choice but to enroll first before paying. Take note that before you can pay your bills through BPIExpressOnline, you should enroll your BPI account first. Please read my post on how to enroll your account in BPIExpressOnline. Here are the easy steps that I did to enroll my Smart Bro bills. Step 1: Log-in to your BPIExpressOnline account. Step 2: Hover the mouse pointer over “Payment & Reloading” then hover over “Bills Payment” and then click on “Enroll All Other Bills”. Step 3: Fill up the necessary details. Choose the BPI account that will be the source of fund for payment. Type in the Joint Account (JAI) number. Select the company, which in this case is Smart Communications Inc. Finally, type in the reference number of you billing account. Check if you placed correct information before clicking the “Submit” button. For details, see the image below. Step 4: A pop-up window confirming if you placed the correct info (see imae below) will appear. Click the “OK” button if all the info are correct. Step 5: The Confirmation Page will appear. This means that you are now done enrolling your billing account. You can now pay your bill through the BPIExpressOnline. Now you must read my post on how to pay your enrolled bills in BPIExpressOnline. Welcome. I'm glad that I helped you through this blog post. Did you use service reference number or account number of the smartbro? Because I used the account number. I still have not received confirmation of my payment.. Thank you. I used the account number and I don't experience any problem. Regarding confirmation, are you referring to confirmation via email?